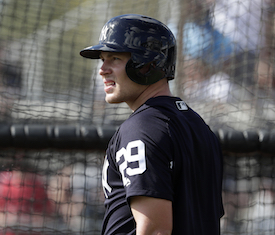 When the New York Yankees acquired infielder Brandon Drury back in Spring Training, it appeared that rookie prospect Miguel Andujar's Major League dreams might be put on hold. Fast-forward to the present day, and it's been Drury whose season was derailed early on by nagging migraine symptoms and Andujar who has taken baseball by storm to the tune of a .310 batting average and subsequent Rookie of the Year buzz. Drury, 25, made eight appearances for the Yankees before blurred vision and headaches forced him onto the disabled list back on April 7. The former Diamondback was reinstated more than a month later on May 14 and found himself optioned to Triple-A after Andujar's blistering start to his career. From April 7 to time of publication, Andujar has slashed .330/.360/.586 over 50 games while earning a reputation as a slugging machine, collecting 31 of his team-high 63 hits for extra bases. While Andujar has thrived, however, Drury too has dominated against Triple-A competition since his return from the disabled list. In 31 games with the Scranton/Wilkes-Barre RailRiders, Drury is slashing .324/.457/.461 with eight doubles, two homers and 14 runs scored. "It's not easy," Drury told Mark W. Sanchez of the New York Post, "but this is going to make me better. Just gotta keep doing what I can do right now, be back up soon." When asked how he felt after learning he was being optioned back to the Minors in lieu of Andujar, Drury admitted, "I wasn't happy about it." Though it's no consolation prize, the RailRiders boast one of the most talented groups of players at the Triple-A level, with a host of big league-caliber players relegated to Minor League life due to the sheer amount of talent at the top levels of the Yankees organization. Drury is among those many talented stars who could easily be a starter for dozens of other clubs in the Majors, but because the Yankees have been on a tear through the opening months of the season -- and Andujar has continued to play a big role in that success -- Drury remains eagerly waiting for his next opportunity. Drury can play almost anywhere in the infield as well as some outfield, so that versatility will only help accelerate his return to the big leagues. Injuries can strike at any moment, and having MLB-quality depth at the ready is what allows teams to sustain high winning percentages over the 162-game grind. But for a player that made more than 130 appearances in back to back seasons in 2016 and 2017, the Minor Leagues are not where he wants to be, to say the least. As Andujar's sensational rookie season continues, Drury continues to work hard every day, "doing what I can right now so when I go back up, I'm a better player."